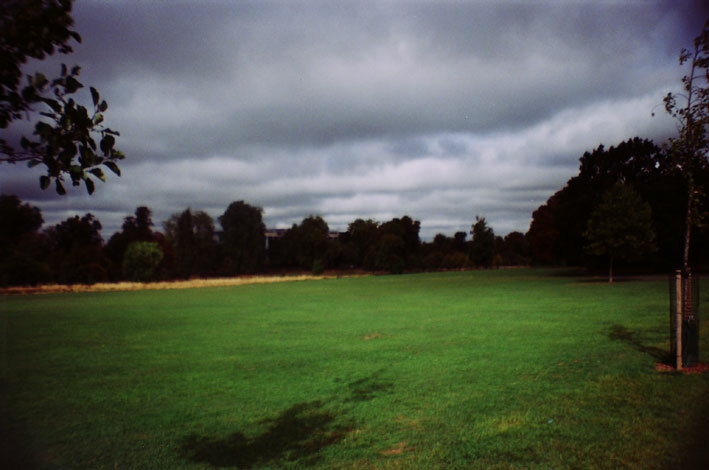 Wanders: Muriel Spark’s Ballad Of Peckham Rye (London). “I shall have to do research,” Dougal mused, “into their inner lives. 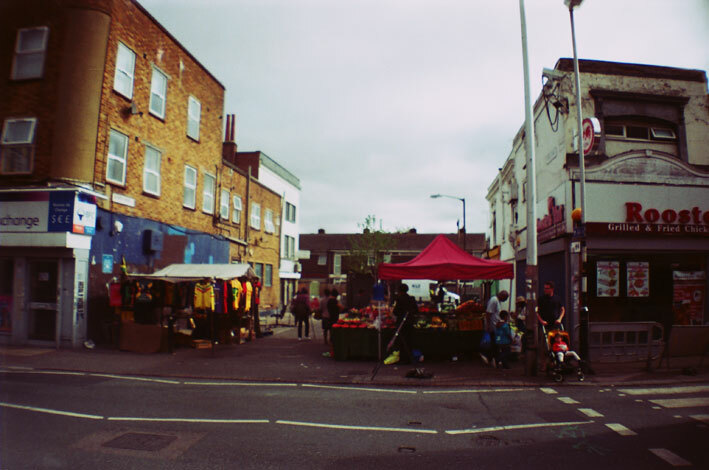 Research into the real Peckham. It will be necessary to discover the spiritual well-spring, the glorious history of the place, before I am able to offer some impetus.” (1960, p.17). To ingratiate myself into newly living in South London, I was keen to find some boundary markers in the area to walk and explore. I had only been to Peckham once before, both to take pictures for an article about the locations of Antonioni’s Blow-Up (1966) and to (eventually fail to) view a flat on Spare Room, advertised by a performance arts specialist from Goldsmiths whose videos consisted of tearing her clothes off in lecture halls. I was keen to explore the area again in spite of my location in West Dulwich being a surprisingly long walk – far longer than the measure of Dulwich generally seems when thinking of it simply as Lordship Lane – and so I sought to find some marker to define the parameters of the area in the hope of finding some happy accidents. I noticed Muriel Spark’s 1960 novel, The Ballad Of Peckham Rye, whilst in a gallery shop on Southbank and was instantly taken by the overt 1960s aura given off by its cover. Upon reading it, such an aura became more powerful, heightened from its original node of evocative cover art by an array of 1960s imagery; secretaries, models of industrial business adapting to the new boom of importing advertising techniques from America and endless visits to a thriving and unpretentious pub/drinking culture. It was all there alongside a heavily detailed mapping of the area. Or so I thought. 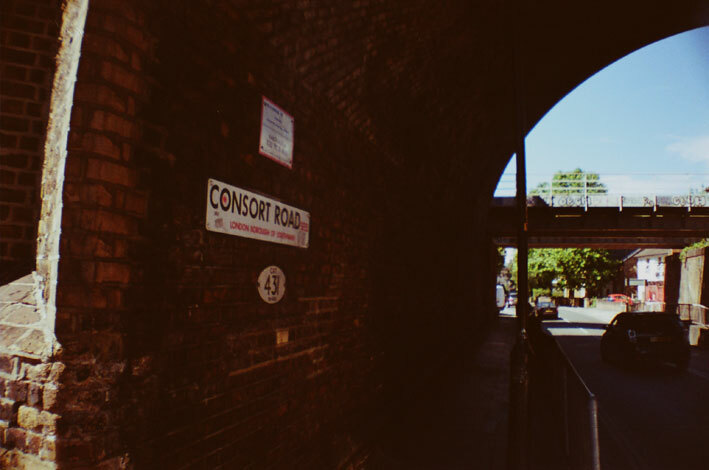 With research, it turned out that, like the London created in Blow-Up which had last drawn me here, Spark had been working at her own London collage when portraying Peckham; mixing a huge array of local inspirations and amalgamating several places from nearby Camberwell Green to mix the real with the fictional. 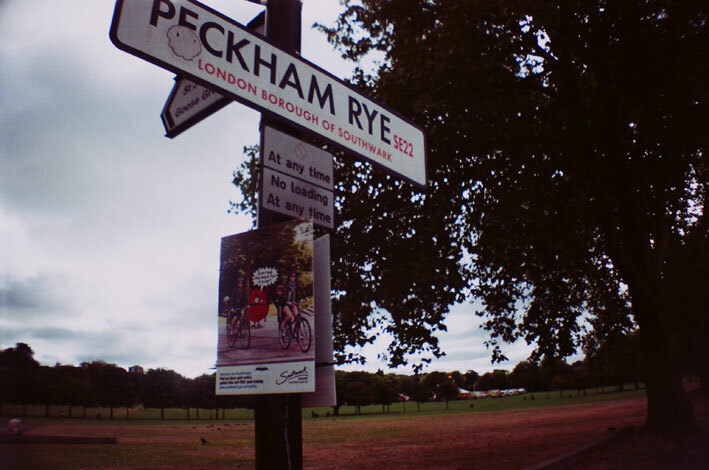 However, there was still plenty of places to visit and they handily marked a relatively linear route through Peckham’s more typical market roads right through to the Rye and eventually Honour Oak Park. 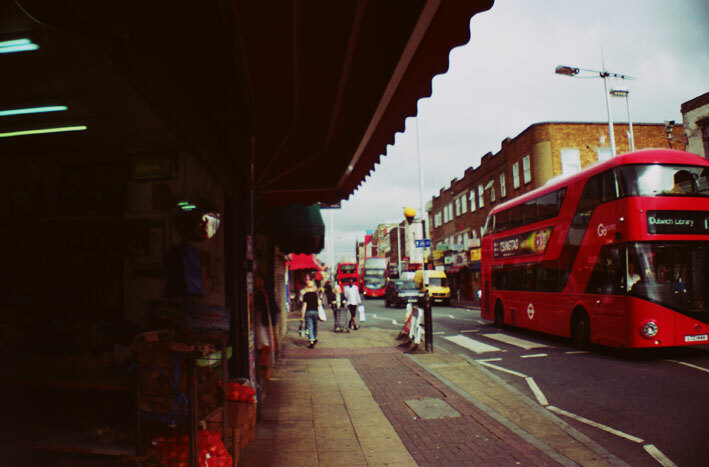 I started by Peckham Rye Overground Station and walked along the pavement, taking in the constant barrage of sensory experience that the road provides. Every type of food seemed to be for sale and floating in essence in the air, accompanied by a range of multicoloured designs, meat laid out like crazy-paving and speakers blaring out so many different types of music as to almost feel the maddening schizophrenia that radios would no doubt be plagued by if sentient. 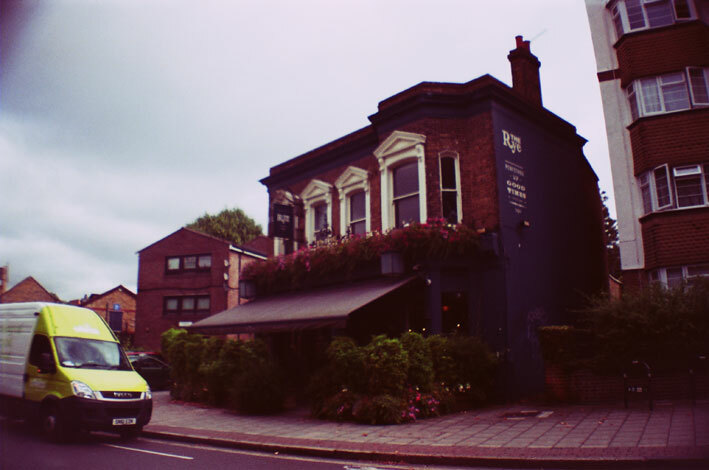 I had started here because this was the quickest way down to the first set of Spark stops on the walk; a collection of increasingly repressive pubs and saloon bars. Before hitting there, I walked past the road that led to the Blow-Up location which gave a faint hint of nostalgia for the high summer meandering I last saw it on. The first scenes with David Hemmings, showing him leaving the work house, are round the corner though the workhouse has long since gone and, if my geography is right, has been replaced by a rather nice digital workspace with a creative, communal yard hidden behind a miasma of buildings (as well as a lorry company). 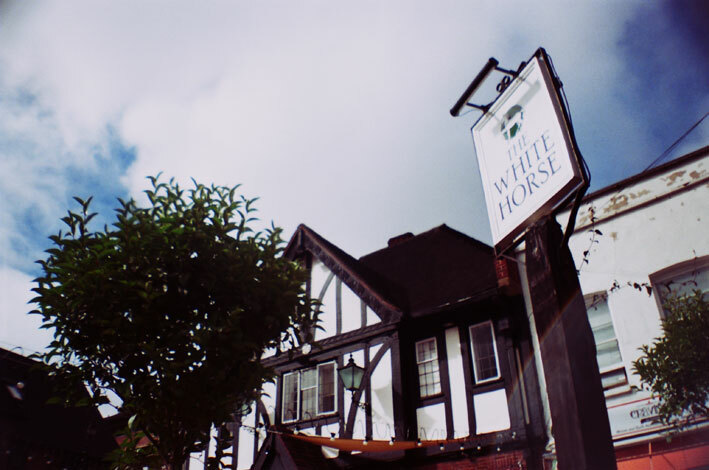 He walked across to the White Horse and drank one bitter. 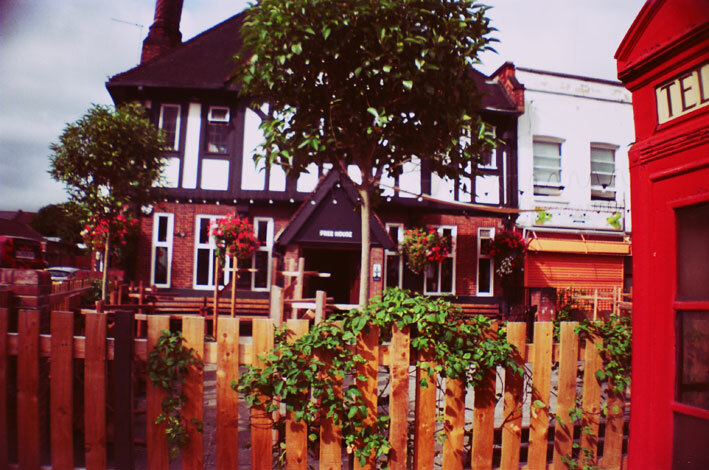 Next he visited the Morning Star and the Heaton Arms. He finished up at the Harbinger. (1960, p.7). All the same, he appeared to consider the encounter so far satisfactory. He got back into the little Fiat and drove away along the Grove and up to the Common where he parked outside the Rye Hotel. Here, he lit a cigarette, got out, and entered the saloon bar. (1960, p.7). The Rye Hotel is still around and seemed to be a popular spot for the local ring-necked parakeets as they squawked their away from the rooftops to the beautiful willow tree on the opposite side of the road. I didn’t venture inside to see if the bar still retained its “saloon” description but this was the most obvious of Spark’s locations based on the real thing. In the spirit of the book, I walked on down and stood in awe of the Rye itself; such a huge and open green space taking almost all of the eye’s view, sitting in stark contrast to the gritty urban character of the road a mere minute away. The characters in Spark’s novel seem drawn here, almost always either passing through it or heading towards it, sometimes to settle fights but more often for unexplained reasons as if it has some supernatural allure. The day itself had a strange feel, initially overcast but with that type of whiteness in the clouds that hurts the eyes to look at. The characters of Ballad had far simpler and better weather for their meanders onto the common: “They were moving up the Rye where the buses blazed in the sun. Their walk was nearly over.” (1960, p.32). My walk was far from over and was only getting more surreal. 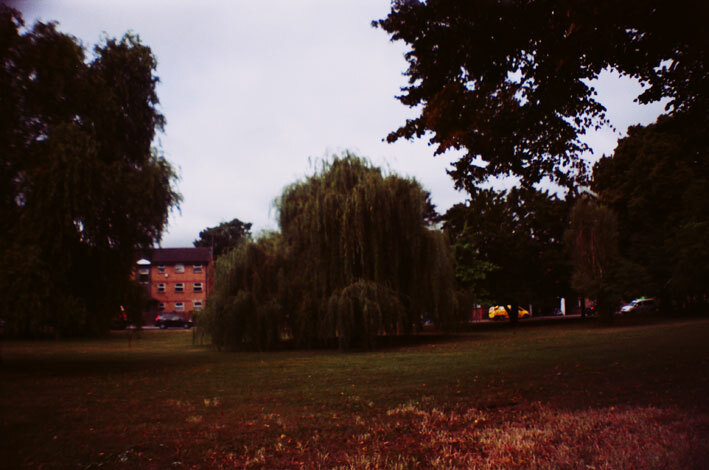 On the common where “It is sometimes told that.. the groom shot himself on the Rye.” (1960, p.14), I was jumped upon by no less than three dogs, all salivating with a typical dumb friendliness. I thought briefly that the strong smell of meat emanating from Rye Lane may have been potent enough to linger on my clothes but then assured myself it was simply down to the inconsiderate owners. I thought of Boadicea and her supposed (but largely contested) death on the Rye as well: I wonder if she liked dogs? 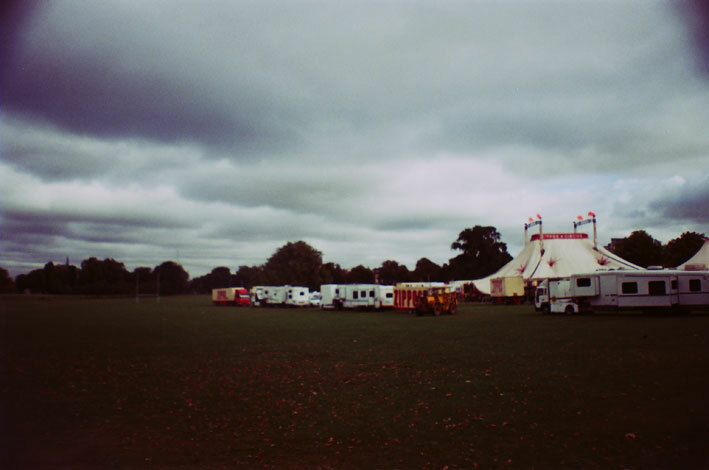 The main common was swamped by a circus currently in town which seemed rather apt for Spark’s novel, with circuses seeming to recall post-war Britain in my mind’s eye due to various films and television shows. “”We feel the time has come to take on an Arts man. Industry and the Arts must walk hand in hand.”” (1960, p.15) suggests the boss of Dougal Douglas in his factory interview. Spark brings the circus further up the road, into the heartland of the terraces, the sawdust and hoops of a false suburbia. I was far and away from that part of Peckham now and right in the middle of the park. 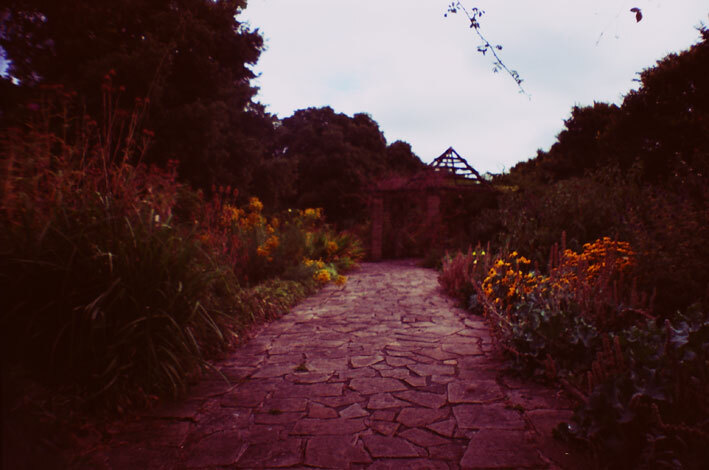 I was looking for the Sexby Gardens, famed for its rose pergolas, as this is where Dougal takes one of the factory girls for a walk: “Let’s go into the Old English Garden.” (1960, p.33). I wanted to get a photo of the main archway through the garden, built into the park at some point between 1906 and 1915. However, a large pram sat in the way so I made do with a few of the garden’s many side-paths and arches leading to various ornamental objects. Dougal’s reasons for bringing the girl here are rather vague, as is his overall reasoning behind the manipulations of the characters of Peckham. He ironically extols that “Peckham must have a moral character of its own.” (1960, p.69) but, apart from seeming an empty gesture, his walks into the place add further ambiguity to his motivations. 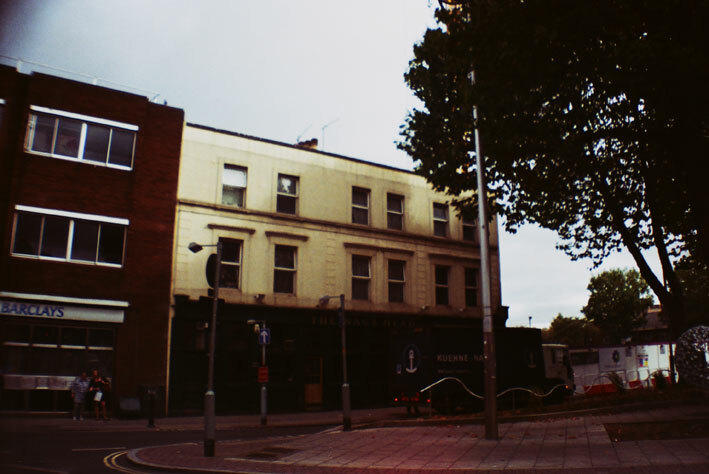 This was something that became clear when walking the mapped-out route of the book; that not only is Ballad a fiction set in Peckham but is a fiction arguably set in a very fictional, fragmented Peckham, given the illusion of linearity by focussing on the most solid topographical features. This is most apparent at the end of this walk where I endeavoured to trudge up One Tree Hill, over the Peckham boarder into Honour Oak Park. According to Dougal this place “… leads to One Tree Hill and two cemeteries, the Old and the New” and then asks his companion, “Which would you prefer?” (1960, p.30). It is undoubtedly the most interesting spot on the walk. 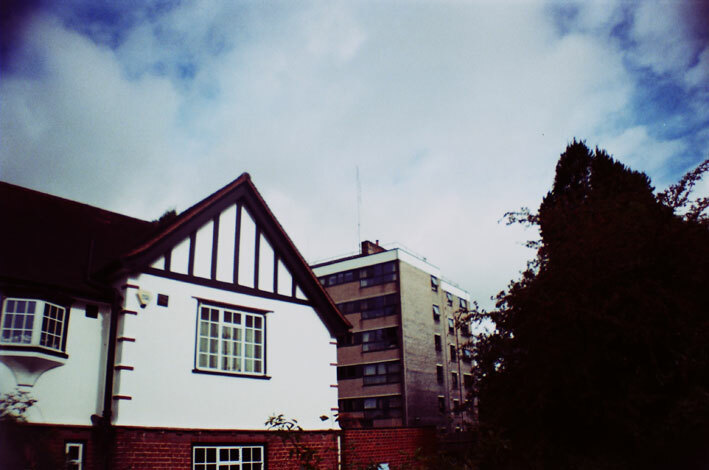 Before ascending the hill, I walked up another road and found a beautiful contrast between a clearly ancient cottage and a brutalist block of flats; such is the character of the place. 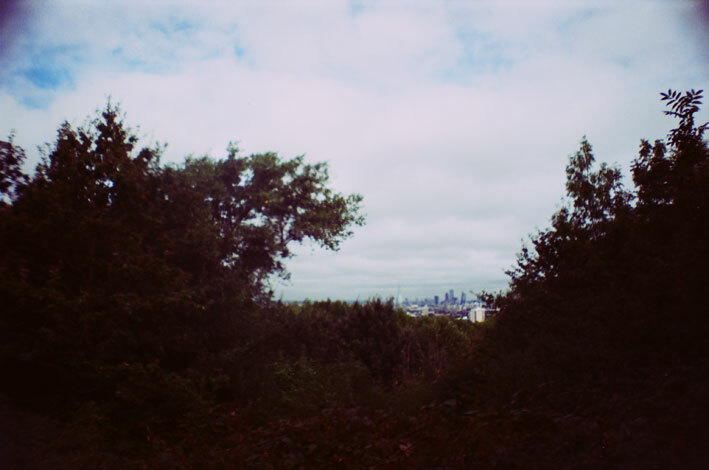 I walked up the leafy hill path, finally to see the view out of One Tree Hill over the entire city. …the Rye for an instant looking like a cloud of green and gold, the people seeming to ride upon it, as if you might say there was another world than this. (1960, p.143). Responses: Alison and Peter Smithson’s Architecture (London).